Baristas del Caribe announced during the opening of its Los Colobos store it plans to invest $5 million in new locations through next year. Starbucks inaugurated its 23rd store Thursday, at the Los Colobos mall in Carolina, becoming the first location in that town to feature a drive-thru window, and the fifth opened since local company Baristas del Caribe acquired the strategic license to operate the international brand on the island in 2015. The company also confirmed a $5 million budget to open new stores through next year. “We’re very proud to have reached Los Colobos. We value this location because from here we can satisfy our customers in Carolina, Canóvanas and Loíza,” said Jaime L. Fonalledas, president of Baristas del Caribe, after revealing they have hired 457 new employees, who are ready to start operations in Montehiedra and Santa Isabel as well. 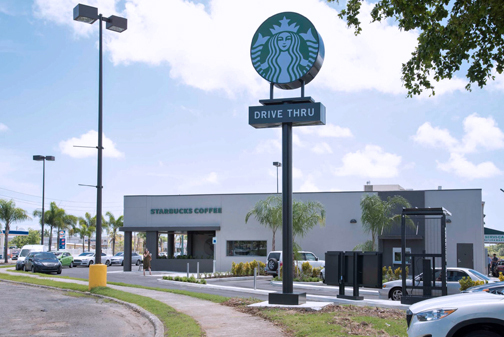 “The establishment of a new store in Carolina denotes the confidence that Starbucks has placed [on us],” Carolina Mayor José C. Aponte-Dalmau said. “Similarly, it represents a recognition of our city’s potential to host new businesses under its continued and increasing economic development. I welcome Starbucks’ willingness to promote job creation and service in the current difficult economic situation,” he said. Idis Ortíz, general manager of Starbucks, said candidates have been hired in each town, as part of the company’s integration into communities. “We’ve had the opportunity to create jobs for our young college students in specialized fairs in different municipalities and educational institutions such as the Universidad Metropolitana and Universidad del Este,” she added. The next Starbucks stores are projected to open in August and September. Hey Buddy!, I found this information for you: "Starbucks opens Los Colobos store, 2 more in pipeline". Here is the website link: https://newsismybusiness.com/starbucks-colobos-pipeline/. Thank you.